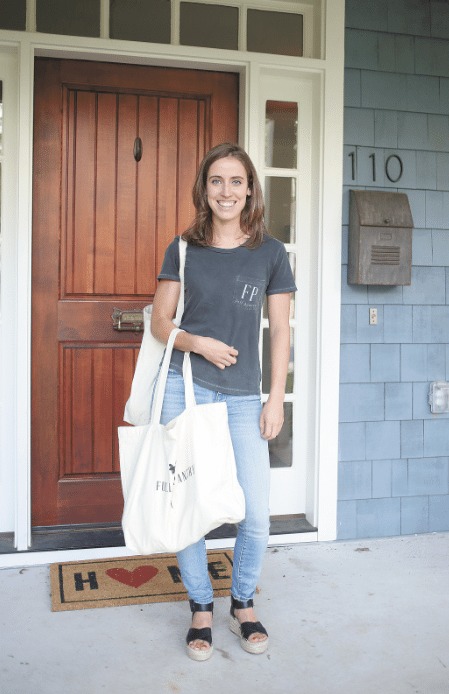 Madison Murphy started Full Pantry, a boutique grocery store shopping and delivery service, in January 2016. Journal photo by Heather Campbell. Watch Madison Murphy navigate Whole Foods Market, and you’ll see a supermarket specialist at work. Murphy started Full Pantry, a boutique grocery store shopping and delivery service, in January 2016. A year and a half later, the 24-year-old has a customer base that includes singles, young married couples and even one family with 10 children. “I thought I would have mostly working parents, but it’s been a mix,” Murphy said. Whole Foods is just one of the places where she shops for her clients; she’ll go to almost any Birmingham-area supermarket. While you can sign up for the service through her website, fullpantrybham.com, Murphy likes to launch her relationship with new clients by meeting them at their favorite grocery store. Murphy will go not only to her clients’ favorite grocery stores, but also to specialty places such as We Have Doughnuts, Bandit Baking Co. and Bunch Bakeshop, a gluten-free bakery on U.S. 280. She’ll also shop at Pepper Place and other farmers markets. Murphy delivers the goods Monday through Saturday throughout the Birmingham area. The cost for shopping, delivering and unpacking groceries is 20 percent of the bill with a $20 minimum and $50 maximum. There’s an extra $5 charge per additional store. Murphy, who grew up in Hoover and now lives in Columbiana, said she’s enjoying exploring all the food options in Birmingham. “I never knew how much I loved the city; now I’m invested in it,” she said. Before starting Full Pantry, Murphy’s chief interest was music. She credited her parents, Sandy and Don Murphy, for helping her get started. More family support came from her sister, photographer Meghan Murphy, who made photos for the Full Pantry website. Murphy said some of her clients want specific brands, while others aren’t picky. Wearing her Full Pantry T-shirt, Murphy is on a mission when she shops. If she’s filling more than one client’s list at a particular store, she completes one list before starting on the next one, she said. “I have to check expiration dates, prices and sometimes buy special foods,” she said. Chelsey Heslop, who lives in Homewood, said she heard about Full Pantry through her sister. Heslop said she and her husband, Kyle, have been married about a year and a half. Using Full Pantry has given the couple time to prepare meals at home. The Heslops usually get deliveries once a week.